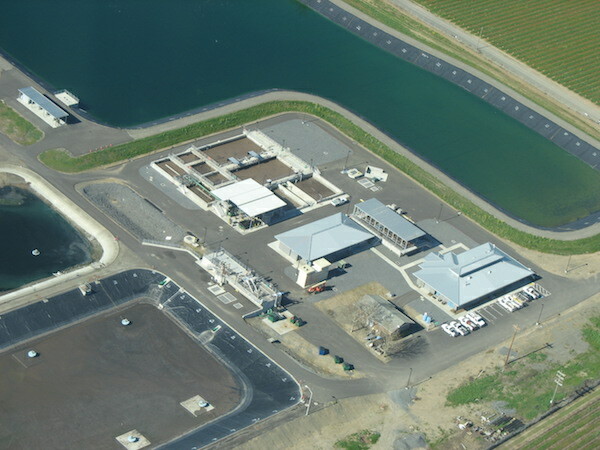 The city of Healdsburg Wastewater Treatment Plant (WWTP) is located 60 miles north of San Francisco in the heart of Sonoma County. Prior to upgrading the facility, the wastewater treatment process consisted of aerated lagoons that discharged into an effluent pond adjacent to the Russian River. In 2004, a U.S. district court designated the existing effluent pond as Waters of the United States, making the Healdsburg plant subject to the Clean Water Act and necessitating the need for a National Pollutant Discharge Elimination System Permit (NPDES). The city of Healdsburg needed to initiate a plan that not only addressed the regulatory requirements, but also the increasing water needs of its wine industry. To meet these requirements, the upgrade project would need to increase the level of treatment to advanced wastewater treatment (AWT) standards, which would allow treated wastewater to be reclaimed for irrigation of agriculture or public areas. The Healdsburg WWTP consists of two parallel biological trains configured for biological nitrogen removal and five membrane tanks with a common overflow weir. Through this process, almost all the effluent at the plant is reclaimed for unrestricted use. The system would advance treatment to the highest level. The MBR technology was able to meet current and future regulations. The Evoqua Memcor team’s industry experience was valuable to operators. The Healdsburg WWTP has become one of the most advanced treatment facilities in California. It was designed to have an average dry weather flow of 1.4 mgd with a sustained peak of 4 mgd. The original treatment lagoons now are used as equalization basins during winter storm events, which allowed the city to build the treatment plant with a smaller peak flow than it would otherwise need for handling these events. The Healdsburg WWTP consists of two parallel biological trains configured in a Modified Ludzack-Ettinger (MLE) process for BNR and five membrane tanks with a common overflow weir. The membrane operating system has been designed so that one tank can be out of service in all flow conditions for maintenance or cleaning. The filtrate is drawn through the membrane surface by applying a suction pressure from a rotary-lobe positive displacement pump. As this occurs, the suspended solids and bacteria are retained in the mixed liquor and returned to the biological system by overflow. Each membrane tank was equipped with 128 immersed membrane modules. The filtrate flows through low-pressure, high-intensity ultraviolet lamps and then to discharge. Ultimately, virtually all the plant effluent will be reclaimed for unrestricted reuse. “My experience with treating wastewater went from pond plant to MBR; like Volkswagen to Ferrari. I don’t know why anybody has anything other than an MBR plant because it makes awesome effluent,” said David Hambly, wastewater operations foreman for the city of Healdsburg Utilities Department. The city of Healdsburg WWTP’s recycled water provides a local water source that is making its thriving agricultural community less vulnerable to droughts and water-supply constraints. Water that was once discharged now is being used as irrigation for local vineyards and commercial landscaping. “We are very proud of the success we have had so far and excited about using the water for additional applications in the community,” said Rob Scates, water and wastewater superintendent for the Healdsburg Utilities Department. The city now is proposing to increase the amount of water being reused, thereby eliminating the discharge to surface waters. Additional applications being considered include orchards, irrigated pastures, direct livestock and forest protection.